From RetroZap: Everything a Fan of the Show Could Want! For the first time ever, you’ll get a chance to peek behind the curtain and see how X-MEN: The Animated Series came about. Eric Lewald has opened up his personal files going back over 25 years and reached out to dozens of people who helped make X-Men: TAS happen. Voice actors, artists, writers, and executives look back at the project that everyone in Hollywood thought couldn’t work, and how it became the country’s #1 hit animated program, running for five remarkable years. 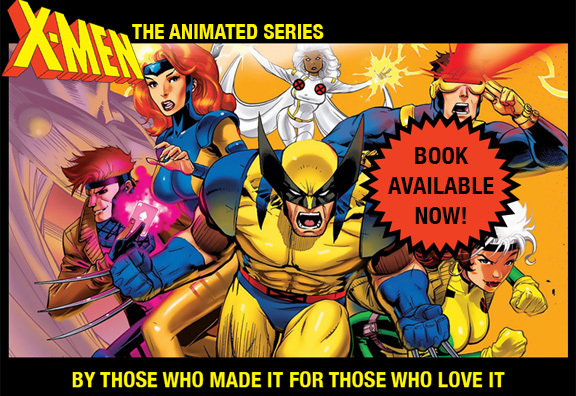 It all comes together in Eric’s new book: PREVIOUSLY ON X-MEN The Making of an Animated Series arriving this fall from Jacobs Brown Media. Eric (right) shakes hands with Steven Kates at the contract signing with Jacobs Brown Media.